While the world watches the ECB, China, and now North Korea, the Fed's balance sheet has reached a new high last week. There are two components of this balance sheet increase: a large spike in the Central Bank Liquidity Swap (discussed earlier) and a substantial purchase of mortgage-backed securities (MBS). This has led to some speculation about the fed's next move, but the rationale here is actually quite simple. Just as was the case last year, with mortgage rates hitting new record lows, the refinancing activity has stayed elevated, particularly since August. 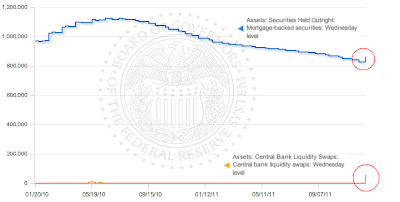 This caused a decline in the principal amounts of MBS held by the Fed (blue chart above). Last week's purchase was simply an adjustment to compensate for some of that decline. There is broad consensus however that at some point it may no longer be just an adjustment. 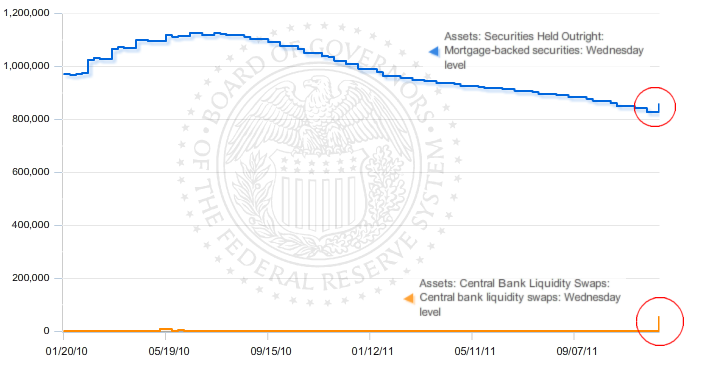 Dealers think the Fed will soon begin an MBS purchase program that will drive mortgage rates to extremely low levels. As a result, the 30 year fixed mortgage could hit 3.5% or even lower. The last FOMC meeting however provided no hint of such program. The Fed is not in a hurry to launch something like this for two reasons. First, at this stage it is the only viable tool that will have a material impact on asset prices and they want to reserve it for a potential escalation of the European crisis. Second, the Fed is not totally immune from political pressure, and such a move will generate a great deal of criticism. Given the relatively decent economic data coming out of the US, "operation twist" is all we are going to get for now.